Phew! What a week it has been. This has been one of the most emotional, difficult and enjoyable weeks of my life; it has been filled with such difficult lows and such proud highs. This has to be, without a doubt, one of the most difficult things I have ever done. Monday morning, that first morning, I could feel a piece of my heart tear off as I closed that front door and left. I couldn't even bring myself to kiss him or look at him because I felt just utterly devastated. It is a cruel fact that when you have bills and debts to pay, and your husband earns less than you, that has to mean leaving your child in order to go to work. We are incredibly lucky that only some of the childcare is with 'strangers', as Luke's shifts and the help of my mum means that most of the time he is with one of us. I have spent much of this first week back in full time work feeling terrible - I have cried, moaned, and felt jealous. It has been tough returning to the hamster wheel life of full time teaching, and even more difficult knowing that what I really want is to be at home with Jake. That said, what has been nice is seeing Jake happy with Daddy/ Nanny or nursery. School have been really supportive this first week and my departmental colleagues have been really great. The first morning I left Jake at nursery was really tough for me. The lady who is Jake's key worker wasn't the lady that greeted us and so I left him with a different lady (I later found out that Jake's key worker starts a little later at 8am, and we drop off at 7:45 so just a short gap). Jake seemed uncertain as I left and it almost killed me. But - I headed off to work. Around 11am I rang to see how he was - they were mystified - Jake wouldn't nap! They said they tried everything -rocking, patting, swaying but nothing. I stopped them immediately and said told them that Jake doesn't need those things - just put him down in a cot and he will go to sleep by himself. So that's what they did - and hey presto! He slept. It was great to see that Jake enjoyed his first days at nursery - his daily report sheets showed he had gotten along well with the other children and that he'd played with some new toys, including some wooden instruments. After just 2 days, Luke and I noticed a difference in him - more alert, more confident, grabbing out for things, chatting more and amazingly he has discovered he can bang things on floors etc. All of this has helped reinforce my decision to put him in nursery a few times a week, and despite my own attachment issues he is doing well. Yay! Amazing... weird to think that had he been on time, rather than so late, he would be on to 6 months almost! 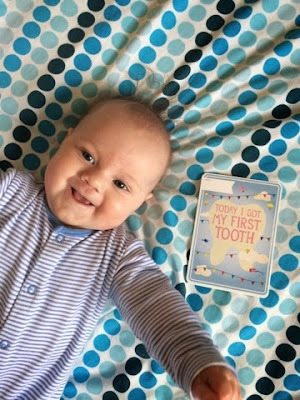 We're so chuffed and proud to see that Jake has cut his first tooth! Bottom left front tooth (Jake's left). He's growing up so quickly! Unfortunately, it has been accompanied with a flare up in his eczema and a nasty cold. We've gone back to night wakings (but not feeds) which has been tiring when coupled with my return to work. We gave it him with his 11am bottle and he loved it - such a great moment and one we won't forget. Jake Saw His First Fishy! A day trip to a local garden centre today, had us visiting the aquarium section. 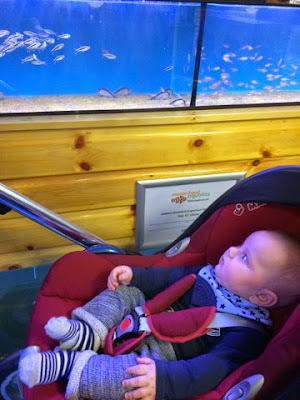 Jake had the best time and loved watching the fish swimming in the tanks...think we'll have to get some ourselves!! 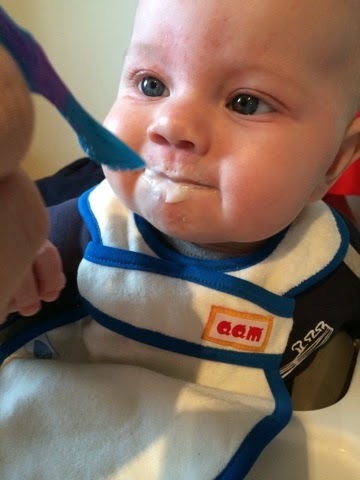 Yay I am glad Jake took to the baby rice. :) Well Done. I'd give it 3 days or so now and try something different like carrot. Can't believe he already has a tooth. 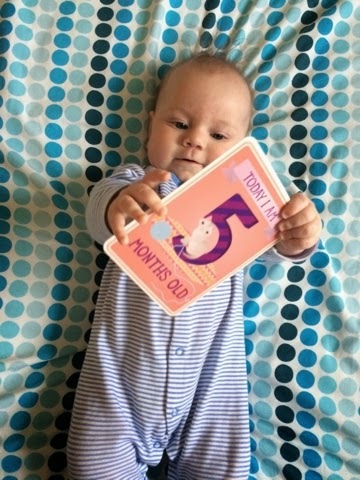 My first new born didn't get his until he was 13 months old. I know Janine! Can't believe he has his first tooth either, scary! Oh gosh! I can see how hard it would be to leave him to go to work, he is SO CUTE! Gotta love a baby that can put themselves to sleep though!